This pie is a mouthful. Both in name, and in sheer mouth-filling density. But I think it turned out pretty damn good. It’s a combination of an oatmeal pie (like a poor man’s pecan pie), and my favorite Martha Stewart carrot cake cookie sandwiches. The creamy stuff piped on top makes it taste much like an oatmeal cream pie and these are all good things. Give it a go if you too are in search of a pie featuring local ingredients and only have piles of carrots at the market. 4. Meanwhile, spread the oats on a sheet pan and toast on the lower rack of the oven until very lightly browned and fragrant, 10-12 minutes. Remove and set aside. 5. Melt the butter in a medium heatproof bowl set in a skillet of water maintained at just below a simmer. Remove the bowl from the skillet; stir in the brown sugar and salt with a wooden spoon until the butter is absorbed. Beat in the eggs one at a time, then the corn syrup, vanilla, and vinegar. Return the bowl to the hot water; stir until the mixture is shiny and warm to the touch. Remove from the heat. 6. Stir in the toasted oats, the ginger, cinnamon, nutmeg, grated carrots, raisins, and coconut. 7. Lower the oven temperature to 350 degrees. Pour the filling into the hot, lightly browned pie crust and bake for 55 minutes to 1 hour, or until the filling has puffed up but still has some give in the center, like gelatin. Allow to cool completely. 8. 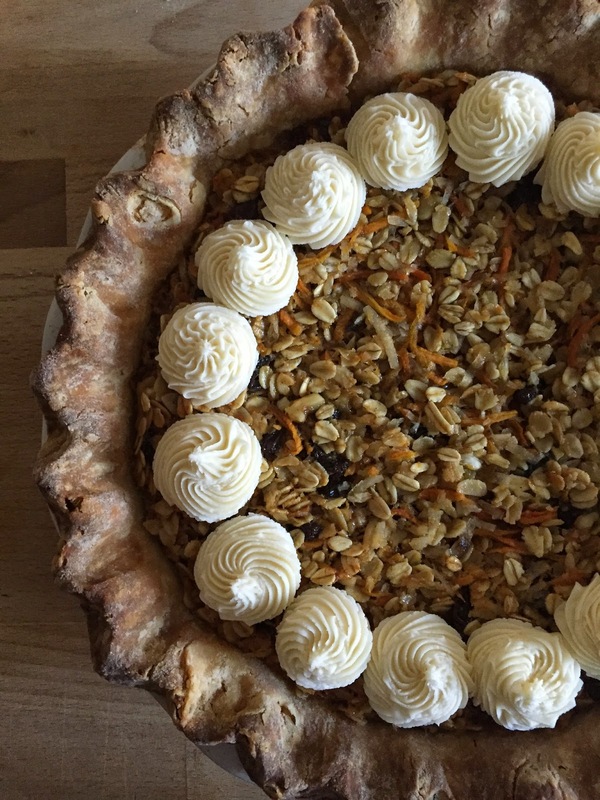 When pie is completely cool, pipe cream topping around the edge and enjoy.